Join GO’s $10-for-10 Campaign to Celebrate 10 Years of Jobs and Justice in Asheville! Celebrate Black History Month by Hiring Southside Kitchen Catering! Thanks to all who attended last week’s Open House! J Hackett, GO’s executive director, accepts the Small Business of the Month certificate at the Asheville Chamber. 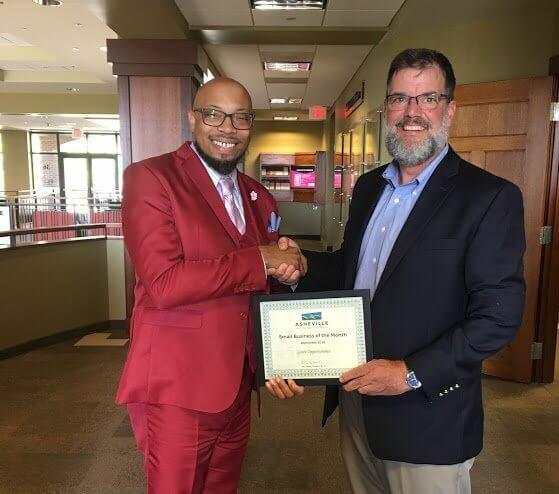 Green Opportunities is pleased to share that we were selected as Small Business of the Month for September 2018 by the Asheville Area Chamber of Commerce. GO is proud of the workforce training, job placement, and social enterprise work we do in our community and we are honored to receive this recognition. As part of this recognition, the Chamber showcased GO’s work on their blog. Click here to read their post.